Get playful and creative with glass, using our glass paints & Frit (Crushed Glass). Workshops are available anytime, for those under 11. Children's Workshops are available to those under 11. We provide a square glass template, upon which Glass paints, and crushed glass can be used to colour & decorate any design. All work is then fired and can be slumped into a 10cm bowl, or remain as a 10cm square, to hang in a window, or use as a coaster. Children's Workshops on average take an hour, however there is no time limits, all work is fired and ready for collect within two days. Work can be posted at an additional charge. The cost of this course is �25 per participant. 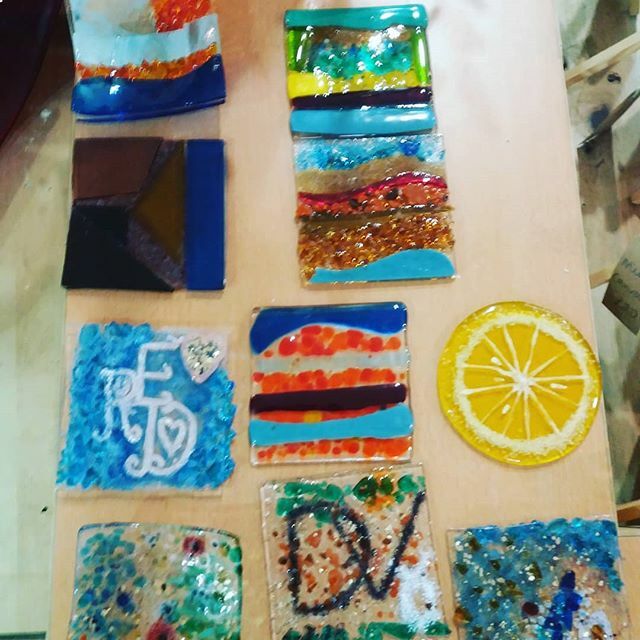 Kids Fused Glass Workshops at Dalegate Market - Get playful and creative with glass, using our glass paints & Frit (Crushed Glass). Workshops are available anytime, for those under 11.